The allure of Amtrak’s long-distance Empire Builder is, in part, time. The route, which runs from Chicago to Seattle and back daily, takes 36 hours with no delays. (More on that later.) A direct flight takes approximately one-10th of the time for roughly the same price. The duration hasn’t dampened enthusiasm for riding the rails. Now in its 85th year, the Empire Builder is Amtrak’s most popular long-distance route; in 2013, approximately 530,000 passengers boarded the silver, two-level train. 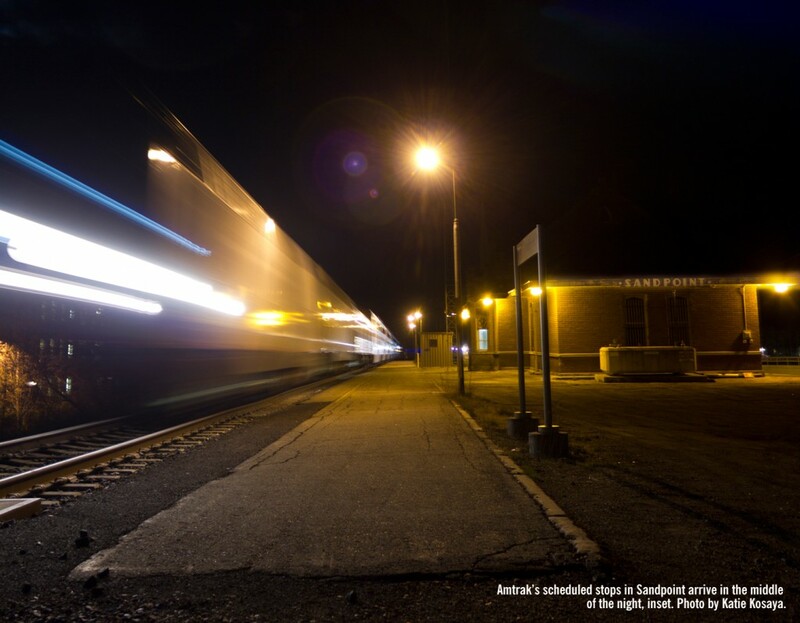 More than 9,000 of those passengers – up from 5,606 in 2010 – boarded in Sandpoint, Amtrak’s only stop in Idaho. The irony is that the Empire Builder’s namesake, James J. Hill – he who famously declared “Give me snuff, whiskey and Swedes, and I’ll build a railroad to Hell” – chose the Great Northern route for its direct access to Pacific ports. Those tracks reached Seattle in 1893 and are today’s Empire Builder route. Fortunately for passengers on the Empire Builder, much of that Rocky Mountains scenery remains relatively undeveloped. The train-travel experience remains pleasantly old-fashioned, too, free of the travel-souring tactics that airlines have adopted. Melody Circo, of the Greater Sandpoint Chamber of Commerce, notes that trains are appealing to an older population, because you just get on and stay. Aric Spence of Sandpoint is a fervent fan of trains, both as an observer (see stories on railfans and the depot, pages 84 and 87) and as a passenger. “People sometimes complain about the time that the Empire Builder arrives in Sandpoint, but I like that I can hop on the train in the middle of the night, have breakfast in the Cascades at 7 a.m. and be in Seattle at 10 a.m. and not have spent a day driving,” said Spence. Rail travelers seem to prefer a simpler way to travel once they reach their destinations, too. Particularly because train depots traditionally anchor downtown areas, rail travelers can often link together vehicle-free vacations. For example, rail visitors to Whitefish, Mont. – the fifth-most popular Empire Builder destination in 2013 – can board the community’s business-subsidized SNOWBus and ride directly from the train depot to Whitefish Mountain Resort in the winter. Likewise, travelers to Sandpoint can ride from downtown to Schweitzer on the SPOT bus. Furthermore, on state lines such as Amtrak Cascades, cyclists can simply roll their bike on to a dedicated rack with a prior reservation. On other lines such as the Empire Builder, travelers can buy a bike box for $15 and check the cargo like any other piece of luggage. Cyclists can check folding bicycles for free. Hirabayashi says that Amtrak is putting together a bike task force to investigate how to serve cyclists better. Or, just checking out the scenery. Recently, the Empire Builder’s schedule has been derailed by a 21st century boom: the oil fields in North Dakota. Although the federal government mandates that Amtrak be assured of delivering on-time trains, overtaxed tracks in North Dakota have resulted in consistent and significant delays for Empire Builder passengers – up to 12 or 13 hours. To mitigate the delays, Amtrak recently adjusted station times to the west of the oil fields. (The westbound train is now scheduled at 1:19 a.m. in Sandpoint). Furthermore, Burlington Northern Santa Fe, which owns the tracks on which the Empire Builder runs, will begin laying down more than 80 miles of new tracks and doing repairs to existing tracks to spread out the train burden. But this, too, will take time. The schedule changes may work to the advantage of Inland Northwest rail passengers, who have traditionally had the exceptionally beautiful Selkirk Mountains and Kootenai River valley pass by under the cover of darkness. The wait doesn’t seem to bother most rail passengers. Circo agreed, saying, “There’s one thing about trains – there’s definitely a built-in clientele.” Like bed-and-breakfast enthusiasts, rail travelers pay for the luxury of a slower pace. And, while train-car demographics tend to skew older, the appeal of slow travel may spread in a world where everything else is speeding up. Would be nice if in one of the glowing touts of Amtrak to Sandpoint if someone could explain what happens when you arrive in Sandpoint? Are there any shuttles to hotels available in the evening? Can you get a car rental at that time? How about a taxi? No information anywhere — which leaves tourists to presume the wor$$$t.